Scriptures like Srimad Bhagavatam bring us face to face with the lives of bhagavatas (great devotees of the Lord). Interestingly, the situations they faced are not very different from those we face today, although the timelines are eras apart. However, the very reason they are called bhagavatas is that even in difficult times their lives shone with love, compassion, humility, truth, faith, gratitude and forgiveness – all of which are hard to find in contemporary times. And this is why Srimad Bhagavatam has been bestowed on us. 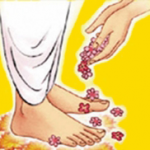 Because the simple path that it shows – Bhagavata Dharma – imparts these noble qualities to us effortlessly and makes our hearts tender and brim with love, so that Bhagavan takes over us. Everyone is familiar with the life of the Pandavas. It was filled with adversity and humiliation. This was especially true for Draupadi. Being the wife of five great, brave warriors and daughter-in-law of the house of the great race of Kurus, one would think Draupadi would have had a life of roses. But it was not so. She was repeatedly humiliated by the Kauravas and had to suffer terribly all her life. However, being the bhagavata she was, each time she unfailingly sought refuge at the Lotus Feet of her beloved Lord Govinda. The last straw from Kauravas’ side came at the end of the Mahabharata war. 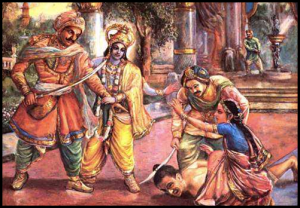 Ashwatthama, the son of Dronacharya, desperate to show his faithfulness to Duryodhana, committed the heinous act of killing Draupadi’s five young sons. In the silence of the night when everyone was fast asleep in their tents on the battlefield, right after the great war, Ashwatthama tread inside and beheaded Draupadi’s innocent sons, who were in no way a threat to him. When Draupadi woke up the next morning to find her young boys dead, she lamented in agony. Seeing her plight Arjuna took a vow to kill the one who had committed that sinister act, and sped off with Krishna to bring the murderer to task. When the cornered Aswatthama saw Arjuna coming towards him, he saw no other way but to use the powerful Brahmastra. 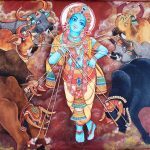 Arjuna immediately took refuge in Lord Krishna, and on His advice, countered Ashwatthama’s weapon with his own Brahmastra and withdrew both the astras, thus averting large-scale destruction. Aswathama was finally caught, bound and brought before Draupadi. But to everyone’s surprise, contrary to the anticipated vengeful reaction, Draupadi forgave Ashwatthama! She did it wholeheartedly, exhibiting her nobility and clarity of character. Forgiveness is not justifying the act. Draupadi never denied the ghastly crime, but she reasoned why he should be spared. Her reasoning was that Aswatthama was a brahmana; that he was their Guru putra – the son of their guru Dronacharya who was the one who had equipped the Pandavas with skills that had made them immaculate warriors; and finally that Ashwatthama’s mother, Kripi, should not undergo the same agony at the loss of her son that she, Draupadi, herself had to undergo. What compassion and foresight this great bhagavata had! No wonder then that her story finds a place in Srimad Bhagavatam itself. A resentful mind binds and destroys the person it dwells in. Forgiveness is untying of the bond of negativity and exchanging kindness for hurt. The charming Krishna is earnestly looking for a pure heart to sit in, and when all the impurities are cleansed from our hearts, He will ascend its throne once and for all.